Eyes play a prominent role in our daily social encounters and are sometimes metaphorically referred to as windows to our souls. There now is compelling evidence to support the notion that much information about another person’s mind can be gleaned from his or her eyes. In one proof of concept, the Reading the Mind in the Eye Test (RMET), developed by Simon Baron-Cohen and his group at Cambridge University in the UK, has documented our ability to identify inner states from the eyes and the region surrounding the eyes. The extent of information that eyes communicate about other minds might be somewhat limited, yet evidence argues against the longheld view of philosophers in the skeptical tradition that the contents of other minds cannot be directly observed. Instead, human eyes form a bridge between self and other by providing direct access to another person’s inner state. The phenomenon is unique to humans alone. Indeed, after comparison with nearly half of all primate species, the human eye has been shown to be morphologically and responsively unique. 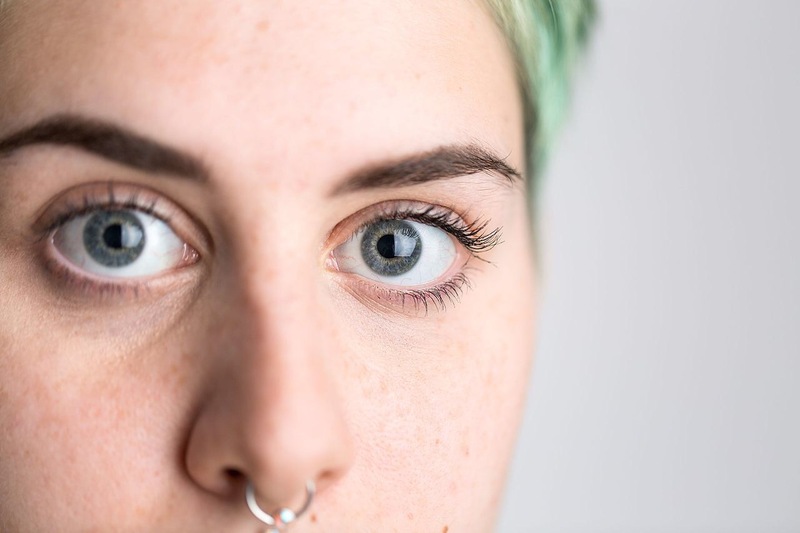 Humans not only show the greatest horizontal elongation of the eye outline and the largest amount of exposed tissue (called sclera) around the eyeball, but are also the only species with sclera that is white. When compared with our closest living primate relatives, chimpanzees, we humans focus more steadily on the eye region when scanning faces. By 14 months of age, the human gaze follows eyes almost exclusively whereas other great apes rely more on head direction. The sensitivity to eyes emerges early in human development. From birth, newborn infants show a preference for faces, despite their poor visual acuity. Human infants prefer to look at faces that have eyes open versus eyes closed. Newborns exhibit a preference for faces only with naturally appearing eyes, including black iris and white sclera, versus control faces with white iris and black sclera. And infants appear to glean emotional information about other minds by gazing at eyes, literally recruiting brain regions that, in adults, are involved in understanding another person’s mental state. Strikingly, by seven months of age, infants detect emotional cues and distinguish between direct and averted gaze solely on the basis of the eye whites. The attachment neurohormone oxytocin modulates our response to eye cues. When the hormone is administered through nasal passages during studies, subjects viewing faces show increased fixation on eyes. Oxytocin also significantly enhances the recognition of emotional and mental states from eye cues. Reduced sensitivity to eyes and eye cues has been described as one of the earliest identifiable warning signs in the development of autism spectrum disorder. Recent studies show that, along the autism spectrum, orientation to eyes is initially present in young infants but later declines between two and six months of age. Characteristic differences in the brain responses to eye-gaze cues recorded at age six to 10 months predicted autism diagnosed at 36 months. Furthermore, older children with autism display enhanced brain responses to eye cues after intranasal oxytocin administration. The connection between oxytocin and mind-reading is nuanced indeed: research shows that genetic variations affecting oxytocin release and breastfeeding experience impact infants’ emotional response to eyes as early as seven months of age. All in all, the ability to read other minds develops early in human infancy, and is deeply influenced by cues from the eyes. The phenomenon requires no explicit, conceptual grasp of other minds, but rather relies on direct experience of others’ emotional and mental states. Of course, humans read others through a variety of modes – the sense of touch, for instance, or vocal cues. But eye cues have always been invaluable during close-range interactions lacking physical contact. Early in our evolution, eye cues were vital for cooperative hunting and foraging, truly essential for groups hoping to avoid predators and catch prey. Today such cues help us negotiate the world writ large, whether passing through crowds or functioning on the job. Communicating through eyes is an aid to cooperation, helping us identify and coordinate with the best partners by gaining access to their minds. Eyes as windows into other minds can be considered a hallmark feature of human social functioning with deep biological roots.